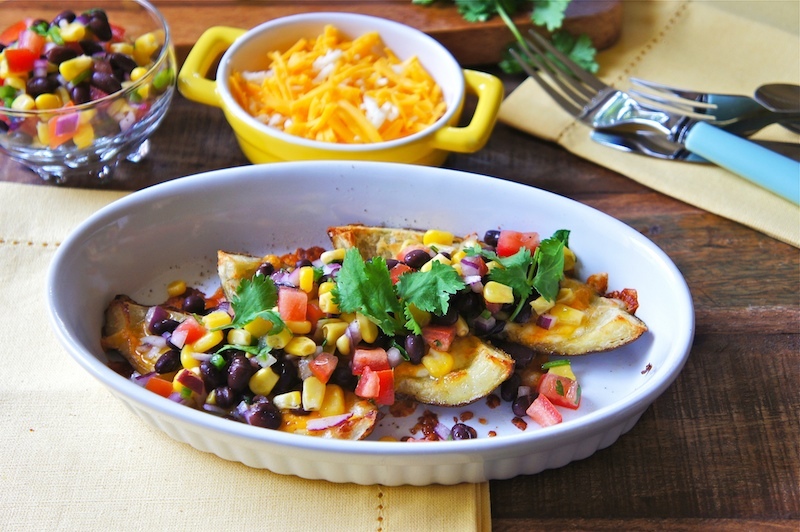 Here are some great tasting Crispy Potato Skins With Black Bean Salsa. Stuffed with lots of cheese and the homemade black bean salsa not only gave this snack a healthy boost, it made it look so much more appetizing and added a cool refreshing taste in your mouth. Simply irresistible, try it! Make the salsa: In a large bowl, combine black beans, corn kernels, tomatoes, onion, Jalapeno and coriander. Season the salsa with lime juice, olive oil, sea salt and pepper. Refrigerate the salsa mixture until ready to serve. Baked Potato Skins: Place the potatoes on a large baking tray. Bake the potatoes for 40 to 50 minutes, or until softened. Remove from the oven and let the potatoes cool slightly. Cut each potato into quarters and scoop out the flesh and leaving about ¼ inch of the potato skin. Place the potatoes on a baking sheet and brush the potato inside out with olive oil and season with sea salt and black pepper. Then bake in the oven for about 18 to 20 minutes on until they are crisp. Scatter the crisp potatoes with cheese, (as much as you like) and bake for about 10 minutes, or until the cheese has melted. Remove from the oven and let cool slightly and top the potato skins with black bean salsa. Yummy and so colourful. I really do like potato skins loaded with lots of topping. I would love to make this! Looks delicious!